Designed in the late 1970s as an anti-aircraft weapon, the Patriot was modified in the mid-1980s to defend against ballistic missiles as well. The system employs a 17.4 foot-long missile powered by a single-stage, solid-propellant rocket motor at Mach 3 speeds. The missile weighs 2,200 pounds and has a range of nearly 43 miles. It is armed with a 200-pound high-explosive warhead detonated by a proximity fuse, causing shrapnel to destroy the intended target. Each Patriot system has eight M-901 storage/transportation containers that serve as launchers, and each launcher has four missiles for a total of 32 missiles. The launchers are attached to the M-860 trailer. The system also has the MSQ-104 engagement control station, which is mounted on an M-818 tractor. The Track Via Missile (TVM) guidance system is the heart of the system. The Patriot system is built around a phased-array radar and fast computers. 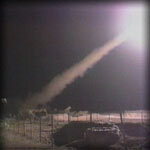 The missile is launched and guided to the target in three phases. First, the missile's guidance system turns the Patriot toward the target as it flies into the radar beam. Then the computer directs the missile to the target. In the third phase, the missile becomes semiactive as its internal radar receiver guides it to the interception. "Typically two missiles are fired at a target, but four would have to be fired at a broken-up Scud to insure that at least two attacked the warhead section. The fire unit's radars generally detected Scuds at about 70 miles, and the unit engaged at 10-20 miles. Alerts were often provided by satellites (DSPs) originally launched to detect Soviet missiles, and the time from alert to engagement was typically 6-7 minutes. The time from engagement to the destruction of the missile was typically 15-18 seconds; the Patriots and the Scud closed at 2,000 to 4,000 ft/sec." --From: "Desert Victory: The War for Kuwait" by Norman Friedman, Naval Institute Press, 1991. Throughout the Gulf War there were continuing military and news reports of the Patriot's success in intercepting and destroying Iraqi Scuds. The Army initially said the Patriot achieved an 80 percent success rate in Saudi Arabia and 50 percent in Israel. Those claims later were scaled back to 70 percent and 40 percent. However, not long after the war's end, analysts began to question the Patriot's performance. The Army and Patriot's manufacturer, Raytheon Company, vigorously defended the system and said it was a Gulf War success story. After a 10-month investigation in 1992 by the House Government Operations Subcommittee on Legislation and National Security, the subcommittee concluded there was little evidence to prove the Patriot hit more than a few Scud missiles launched by Iraq. Another 1992 investigation done by the General Accounting Office found that only 9 percent of the Patriot-Scud engagements "are supported by the strongest evidence that an engagement resulted in a warhead kill." (The GAO defined "the strongest evidence" as instances in which Scud debris or radar data indicated that a Scud was destroyed or disabled after a Patriot detonated near it.) Except in 9 percent of the cases, the GAO report said the Army could prove only that "the Patriots came close to the Scuds, not that they destroyed them." Both reports, as well as studies by analysts (in particular MIT scientists George N. Lewis and Theodore A. Postol) concluded that Gulf War television pictures showing Patriots chasing Scuds were misleading. The television images didn't fully reflect that a number of the Patriots were just wounding Scuds or pushing them off course; big chunks of both missiles then fell to the ground. In Israel, the amount of damages and casualties increased after the Patriots were deployed there. FRONTLINE interview with Bernard Trainor concerning the Patriot's performance. FRONTLINE interview with Rick Atkinson concerning the Patriot's performance. RAYTHEON'S REBUTTAL: Raytheon Company, manufacturer of the Patriot missile system, strongly disagrees with critics of the Patriot's performance in the Gulf War. Here is their statement. Suggested Reading: "Missile Wars" by Seymour M. Hersh, The New Yorker, September 26, 1994.